Formed in the late '70s as Rodney Crowell's road band, the Cherry Bombs' original members include guitarists Vince Gill and Richard Bennett, keyboardist Tony Brown, steel guitarist Hank DeVito, drummer Larrie Londin and bassist Emory Gordy Jr. 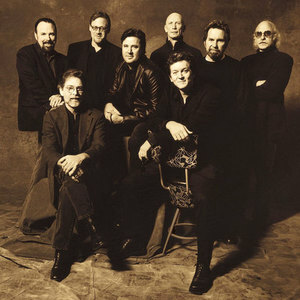 The core group recorded with Crowell during his tenure at Warner Bros. Records and on the first three albums recorded by Crowell's then-wife, Rosanne Cash. Although Crowell and Gill experienced the most visible careers, the other band members' accomplishments are noteworthy, to say the least. Brown, who became an executive at the RCA, MCA and Universal South labels, has proved to be one of Nashville's most prolific and successful producers. In addition to producing hit albums for both Crowell and Gill, Brown's other production credits include projects with George Strait, Lyle Lovett, Reba McEntire and many others. Bennett and Gordy also distinguished themselves as record producers. Bennett's credits include co-producing and playing guitar on Steve Earle's landmark Guitar Town album. Gordy also co-produced Guitar Town and later produced numerous artists, including George Jones, Bill Monroe, Matraca Berg and his wife, Patty Loveless. DeVito, whose songwriting credits include Hal Ketchum's "Small Town Saturday Night" and Juice Newton's "Queen of Hearts," became a successful art photographer. Members of the band reunited briefly in 2002 for a performance at the ASCAP awards banquet, an industry event that takes place annually in Nashville during the week of the CMA Awards. The band's new edition includes all but two original members. Gordy declined to participate in the reunion, and his slot was filled by Nashville session bassist Michael Rhodes. Another studio veteran, drummer Eddie Bayers, fills the position originally held by Londin, who died in 1992. The band features one new member -- keyboardist John Hobbs. With Crowell and Gill sharing primary vocal duties, the musicians went to the studio in early 2004 to record The Notorious Cherry Bombs, their first album as a band. "Notorious" was added to the band's name for legal reasons.